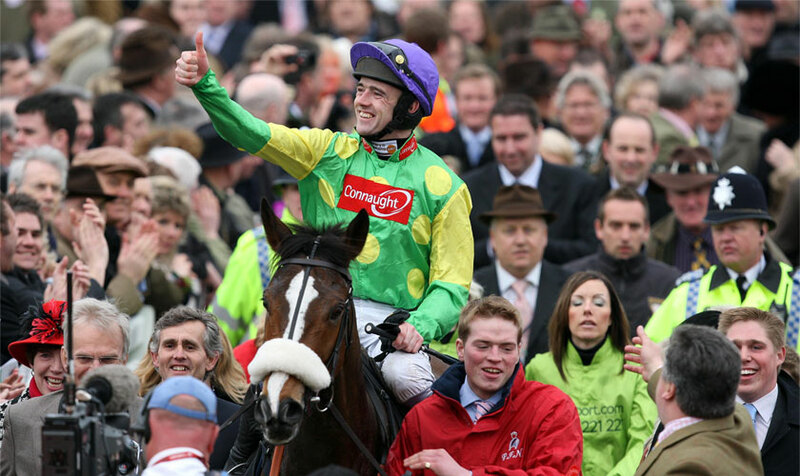 Kauto Star and Ruby Walsh. (Pic: Courtesy of Paddy Power). Boxing Day at Kempton Park has been suggested as a possible date to bury the ashes of Kauto Star who died this month after sustaining injuries in a paddock accident. Kauto Star and jockey Ruby Walsh combined to win five King George VI Chase’s at Kempton Park where a statue of the champion now stands in the centre of the parade ring. The Clive Smith-owned chaser also won two Cheltenham Gold Cups under Walsh in a scintillating career that saw him win 23 of his 41 starts and close to £2.4 million in prize money. Kauto Star’s fifth win in the King George at Kempton on Boxing Day 2011 proved to be his last career win as the Paul Nicholls-trained chaser was retired after his next run when he was pulled up in the 2012 Cheltenham Gold Cup. “Kauto Star was cremated and I’ve already arranged with Kempton that half of his ashes will be placed under the statue I presented to them on Boxing Day ,” Smith said. The statue at Kempton Park is one of two that was commissioned by Smith who arranged for sculptor Charlie Langton to create two over-life-sized statues of Kauto Star, one for Kempton and one to act as a permanent memorial at Smith’s home. “There are two boxes of ashes and I have the same statue here in the garden as at Kempton and I may put some ashes here as well,” Smith revealed.